KIEV, Ukraine -- The White House objected to Russia's increase in natural gas prices for Ukraine on Thursday and said markets should determine prices. A natural gas concentration point is seen near Opishnya, some 280 km of Ukraine's capital, Kiev. 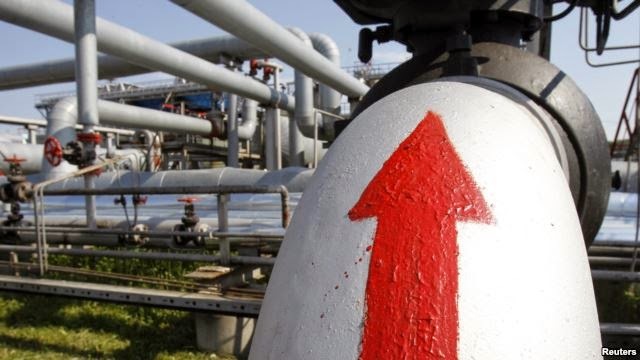 White House Spokesman Jay Carney spoke after Russian natural gas producer Gazprom announced it would virtually double the gas price for Ukraine to $485 per 1,000 cubic meters this month, which Ukraine said was politically motivated. “That kind of action taken coercively against Ukraine is something we oppose,” Carney told reporters. The price hike amounts to an 80 percent increase, piling more pressure on Ukraine's economy, already on the brink of bankruptcy. Moscow has frequently used energy as a political weapon in dealing with its neighbors, and European customers are concerned Russia might again cut off deliveries in the worst East-West stand-off since the Cold War over Crimea. President Obama on Thursday signed into law a sanctions bill against Russian and Ukrainian officials tied to Russia's actions in Ukraine. The measure also includes $1 billion in loan guarantees for Ukraine and increases funding for international broadcasting to the region. Ukraine's new government has alleged that the February killing of protesters in Kiev took place under the orders of ousted president Viktor Yanukovych. It has also pointed to Russian involvement in the bloodshed. A preliminary report presented Thursday by Ukraine's top security and justice officials also accuses the Yanukovych regime, which enjoyed backing from Moscow, of having used a network of hired killers, kidnappers and gangs of thugs to terrorize and undermine the opposition during anti-government protests in Ukraine that began in November of last year. On Thursday, acting Interior Minister Arsen Avakov linked special police from its Ministry of Internal Affairs, acting under orders of Mr. Yanukovych, to the killing of at least 17 protesters. He said 12 "Berkut" police have been identified and that authorities have begun arresting them. For his part, Ukraine's security service chief (Valentyn Nalyvaychenko) said evidence shows Russian agents were involved in "the planning and implementation" of the deadly February 18-20 police operations. More than 100 protesters died as a result of what authorities at the time called an "anti-terrorist operation," many at the hands of government snipers, the report alleges. During the height of the unrest members of Russia's FSB security force had been seen at Ukraine's security service's headquarters, and a Russian plane had flown large amounts of explosives and weapons into Ukraine, one of the officials, Ukraine's new security chief Valentyn Nalyvaichenko, said. The FSB has reportedly denied involvement, but hints of Moscow's hand in the bloodshed could further strain ties with Russia, Ukraine's former Soviet overlord, which annexed Ukraine's Crimea region after Yanukovych's removal from power in what has escalated into the worst East-West standoff since the Cold War. Yanukovych, who fled Ukraine for Russia in late February, has denied personal responsibility for the bloodshed. Meanwhile, Russian Foreign Minister Sergei Lavrov says troops near the Ukrainian border will return to their permanent bases as soon as they finish military exercises. Russia has massed troops on its border with Ukraine following Moscow's annexation of Ukraine's Crimean peninsula, triggering fears of an incursion. Ukrainian officials have said that Moscow has moved as many as 100,000 Russian soldiers to Ukraine's eastern and southern borders. Western officials have put the number at around 40,000. NATO's top commander, General Philip Breedlove, said Wednesday the Russian force is "ready to go" and could take over large parts of Ukraine in a little as three days, if such an order were given. Foreign Minister Lavrov Thursday called on the West to de-escalate the rhetoric, which he said was crossing "into the unreasonable." Lavrov has also asked NATO for answers on its plans to beef up defenses in Eastern Europe -- a move seen as a direct response to the Russian takeover of Crimea. Lavrov said any increase in NATO's permanent presence in eastern Europe would violate a 1997 treaty on NATO-Russian cooperation. NATO Secretary-General Anders Fogh Rasmussen expressed surprise Thursday at Russia’s claims, instead accusing Moscow of "violating every principle and international commitment it has made." He called Russian claims about NATO's actions "propaganda and disinformation." At a meeting in Brussels earlier this week, NATO foreign ministers announced they will officially end all civilian and military cooperation with Russia. The ministers said they do not recognize the annexation of Crimea and urged Moscow to immediately comply with international law. Responding to the move, Russia has recalled its top military representative to NATO “for consultations” to Moscow, a senior defense official was quoted by Russian news agencies as saying Thursday. “We don't see an opportunity to continue military cooperation as usual with NATO,” said Deputy Defense Minister Anatoly Antonov, according to RIA Novosti. Russia protested to Germany on Thursday over remarks by Finance Minister Wolfgang Schaeuble which likened Russia's annexation of Crimea to Nazi Germany's expansion under Adolf Hitler. “We consider such pseudo-historical references by the German minister provocative,” the Russian Foreign Ministry said in a statement. While Chancellor Angela Merkel has distanced herself from Schaeuble's comments, Russia conveyed its unhappiness to Germany’s ambassador in Moscow, Ruediger von Fritsch. Speaking on Monday to a group of students, Schaeuble referred to the arguments used by Russian President Vladimir Putin to justify the annexation of Crimea. Putin cited the need to protect ethnic Russians in Ukraine, something Schaeuble said reminded him of Hitler's vows to protect ethnic Germans in the Sudetenland region of Czechoslovakia in 1938. Hitler first annexed parts of Czechoslovakia, and a year later invaded the rest of the country. Schaeuble's spokesman later denied that the minister had equated Russia with Hitler's Third Reich. Europe's aviation safety authority warned on Thursday of “serious risks” for international airlines flying over Crimea because there may be two services managing airspace there after the region's annexation by Russia. The European Aviation Safety Agency (EASA) said Russia had published a series of notices saying it intended to provide air traffic services within the area controlled by the flight information center at Simferopol, Crimea's main airport. EASA, which is based in Germany, therefore said national aviation authorities in Europe should encourage carriers to avoid the airspace over Crimea, and use alternative routes. “It is unsafe if more than one Air Traffic Service provider is in charge of one single Flight Information Region (FIR); no compromise can be made with the safety of the flying passengers,” Patrick Ky, executive director at EASA, said.